Convocation has been organising these 50th Anniversary Reunion Luncheons since 1985, and they have become a key annual event in the UWA Calendar. Guests are graduates from all faculties, which bring together a wonderful mix of personalities and life experiences. The 50th Reunions are always well attended, with many graduates flying over from interstate and overseas locations for the event. The Reunion will also be attended by Convocation Council members, University officials, graduates from earlier years, some of whom attended or were unable to attend the reunion for the year of their graduation. Each year, Convocation produces a 50th Reunion booklet, which contains a collection of brief biographical profiles for each graduate of that year. These booklets have proven to be a source of considerable interest and a pleasure to read, and also become invaluable historical records for the many and varied contributions that UWA graduates have made throughout their lives. Each year, the 50th Reunion is organised by a committee of volunteers. Click on the tab for the graduation year that interests you to find out more about that event, and peruse past 50th Reunion booklets. 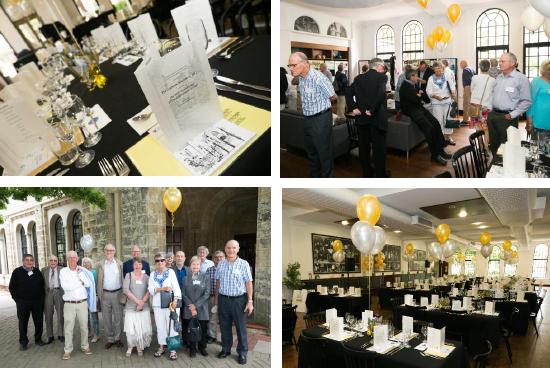 The 2018 50th Reunion for 1968 UWA Graduates was held in the ‘Old Ref' in Hackett Hall at the University of Western Australia on the 20th October 2018. The annual 50th Anniversary Reunion of Graduates of 1967 was held in the Old Ref (now the Hackett Café) in Hackett Hall. The University of Western Australia on 21st October 2017. The annual 50th Anniversary Reunion of Graduates of 1966 was held in the Old Ref in Hacket Hall of the University Club of Western Australia on 8 October 2016. The Tour, Taste and Toast at the `Old Ref? in Hackett Hall, UWA was well-attended. And a great time was had by all! Convocation celebrated the 50th anniversary of the 1964 graduation at the annual Reunion Luncheon. Beautiful decorations, old exam papers provided as place mats, 1960s memorabilia and background music, as well as Barbara Streisand's hit song "The Way We Were" all helped set the scene for the 50th reunion.